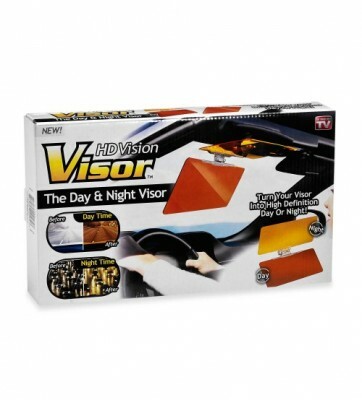 HD Vision Visor-The Day And Night Visor For Car-Night Vision Glass for Car. HD Vision Visor turns your visor into high definition the day or night! From the makers of HD Vision sunglasses. The HD Vision Visor as seen on TV reduces blinding glare from the sun during the day, and brightens vision and cuts harsh headlight glare at night, The 2 in 1 HD Vision Visor enhances color, clarity and contrast, Easy to install. Clips on any sun visor in seconds. The Enem Night Vision Anti Glare Vision Visor is the Solution. It includes two visor plates, for day and for night. 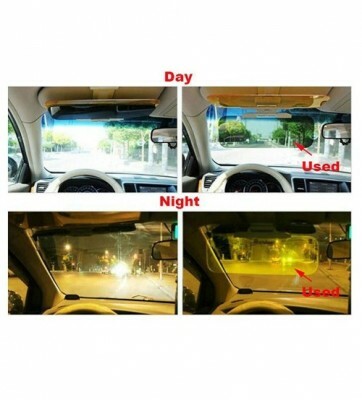 It prevents glare and allow you to enjoy safe driving fun and relaxed than ever! And best of all, it can be easily installed on existing sun visor of your car. Just clip the Enem Visor on your existing car visor and flip down the required visor as per day or night and that is all that is required from you. Leave the rest on this ingenious unit! Go Grab Now and Enjoy safer driving! Package Quantity: 2-in-1 Day and Night Visor! The Only Sun Visor that Reduces Glare and Turns Your Visor into High Def. Easy to Install, Clips on to Any Sun Visor in Seconds! আপনার দিন/রাতের ড্রাইভিংকে আরো নিরাপদ করে তুলতে-Hd-ভিশন ভিসর। দিনের বেলা কড়া রোদে এটা ব্যবহার করলে মনে হবে মনোরম বিকেলে ড্রাইভ করছেন আর রাতের আলোতে এটা অন্ধকারকে বেশ পরিষ্কার করে দিনের মতো ফুটিয়ে তুলবে। ব্যবহার করেই দেখুন, যারা রাতে গাড়ি ড্রাইভ করেন তাদের জন্য এটা খুবই কার্যকরী দুর্ঘটনা এড়ানোর জন্য উপযোগী, আপনার গাড়ির উইন্ডশিল্ডে সুর্যের আলোর কিনবা অন্য গাড়ির হেড লাইটের প্রতিফলন প্রতিরোধ করে, এটি আপনার চোখের সুরক্ষার সাথে সাথে অ্যাক্সিডেন্ট এর ঝুকি কমায় * কোয়ালিটি প্রোডাক্ট, * ইজি টু ইনষ্টল. Highlight: 1. Day and night in together,very convinient,save space. 2. Anti-glare, uv resistance, fatigue resistance, resistance to impact. 3. Adjustable and stable. 4. with it in your car, you need not wear the annoying sun glasses-(যারা রাতে গাড়ি ড্রাইভ করেন তাদের জন্য এটা খুবই কার্যকরী). Product Description: Color: As the pictures show. Material: Acrylic. Size: 32cm*11cm*2cm. Weight: 385g!